madhura. deboo took me on a visit to this delicious place when i stopped by to see his studio in dadar. 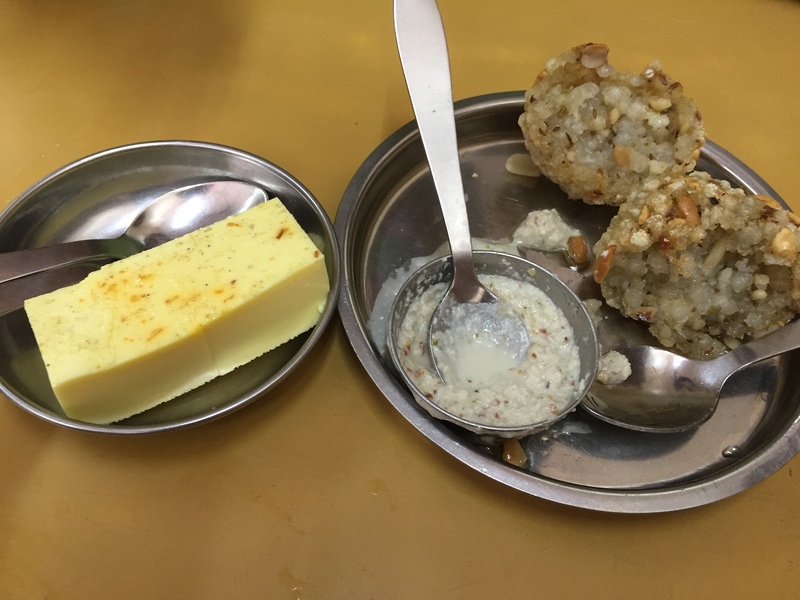 i tried farali misal, sabudana wada, and kharwas, and all were fantastic. i had never had anything like the misal before [a potato and tapioca dish that tastes much better than it sounds], but it was a delightful experience. i also liked it because this is one of those places that you’ll only find and try if someone who knows the area takes you — those are always my favourites. yummy farali misal. bombay, india. may 2015.
kharwas [left] and sabudana wada. bombay, india. may 2015.
maharaja bhog. this place was so very indulgent, but also so very worth it. 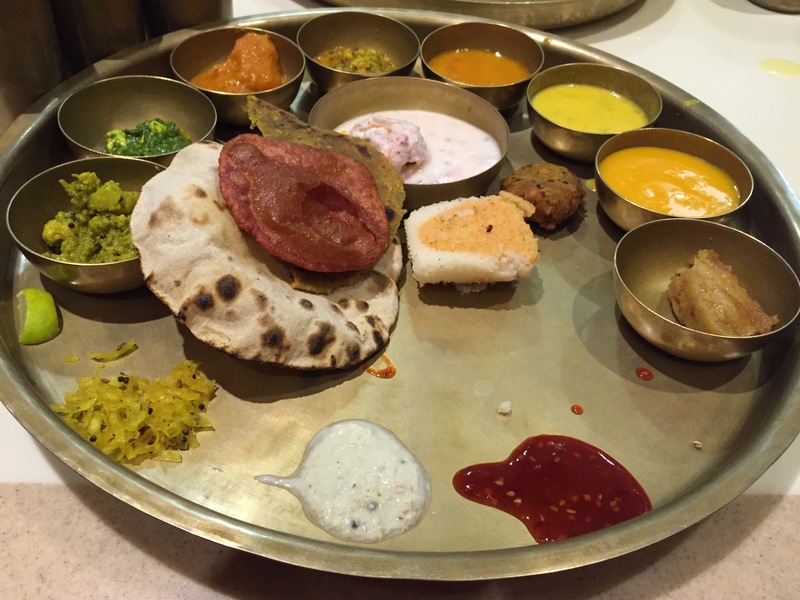 there is only one item on the menu – the thali, which changes every day – and it is absolutely delicious. priyamvada and shambhavi took bettina and me there for dinner one saturday night, and we stuffed ourselves full. if i type out all the items i ate here, i will probably feel a wave of shame because of the sheer amount of food i ingested. but trust me when i say that the food – and the overall experience – are totally worth it. 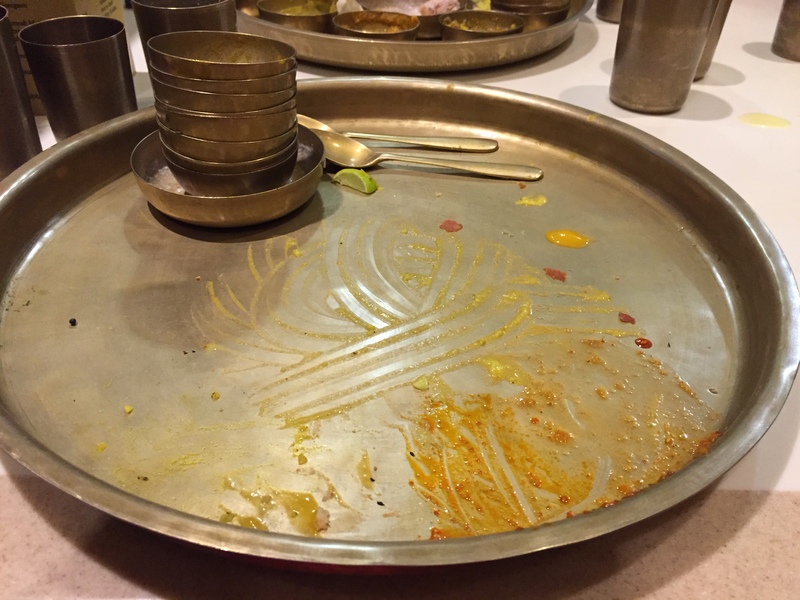 bonus: if you go to the goregaon location, the owner will walk around from table to table and suggest which foods should be paired with others. bonus bonus [and also trouble for my waistline]: there is a location in bangalore! if anyone is up for a visit, let me know. bettina and shambhavi eagerly awaiting their dinner. bombay, india. 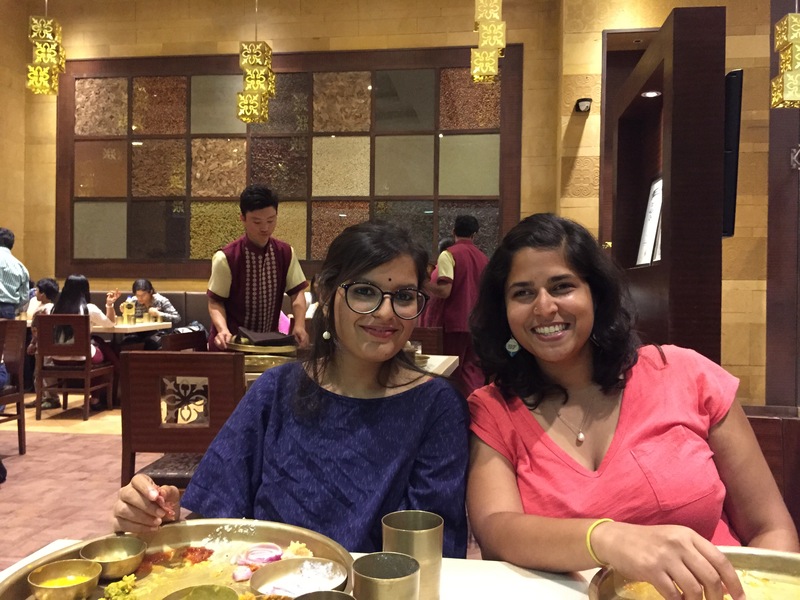 may 2015.
sharing a yummy meal with my work wife. bombay, india. may 2015.
i might be kind of an expert at thalis. bombay, india. may 2015.
madras cafe. as part of the reality early morning bicycle tour, we were treated to breakfast at madras cafe on colaba. 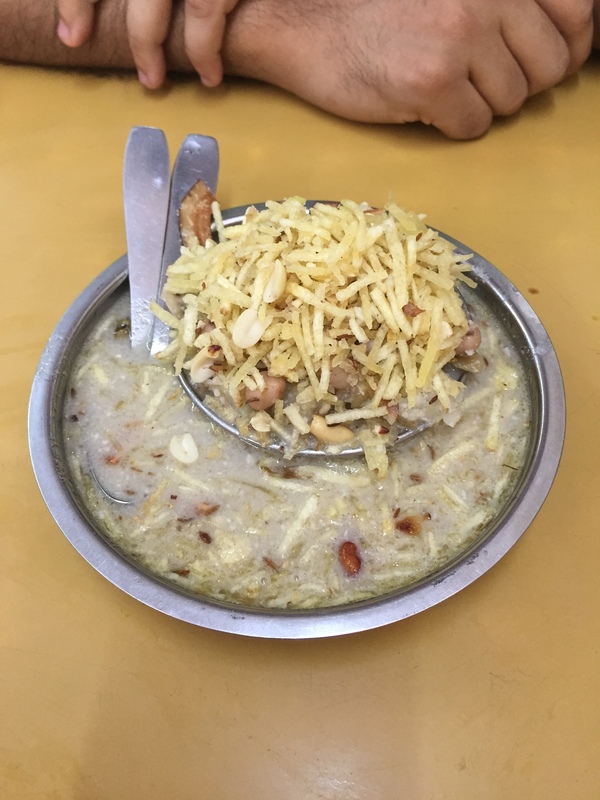 while it is not as famous as the one in matunga, it was still pretty delicious. it’s a proper dhaba, which means it is quite authentic, and my mysore masala dosa was fantastic. highly recommended. 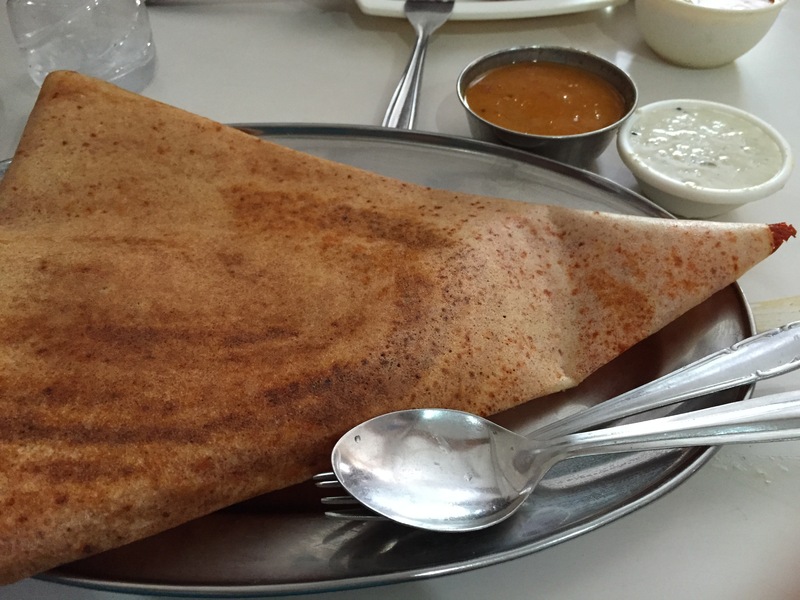 one of the best mysore masala dosas of my life. bombay, india. may 2015.
papa pancho. when i visited deboo’s studio the first weekend i was in town, his father gave me a list of food recommendations for bombay. first on the list was punjabi food at papa pancho, so i checked it out with ashu, bettina, and alejandra one sunday afternoon. 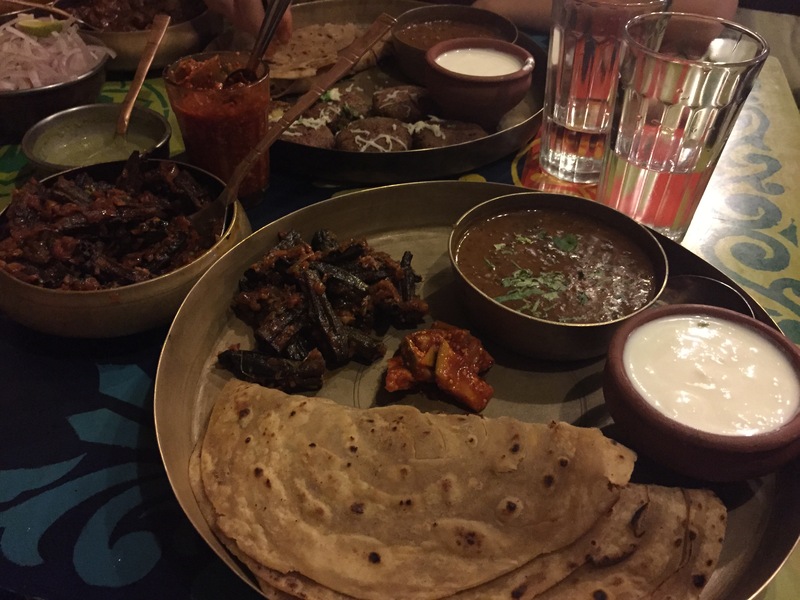 it’s a quirky little dhaba in pali hill, and the food is indulgent and rich and delicious. the dishes come with dal, curd, and your choice of rice or paratha, and it’s a meal that will fill even the hungriest of stomachs. my bhindi masala was fantastic, and what i tasted of the others’ lunches were also good. i would like to return in the future and try one of their non-veg or seafood dishes, but the veg was pretty spot-on. thank you, papa guruji, for the suggestion. only a small portion of our lunch spread at papa pancho. bombay, india. may 2015.
salt water cafe. bharati and treated ourselves to an indulgent evening at salt water cafe in reclamation after a particularly long monday, and it was a fantastic decision. their wine list is pretty extensive, and the food was out of this world. i finished every bite of my lamb shanks and couscous salad, and bharati and i licked our ramekin clean of our creme brulee for dessert. it’s pricey, though, so it’s good for a special occasion, but i would definitely go back again. 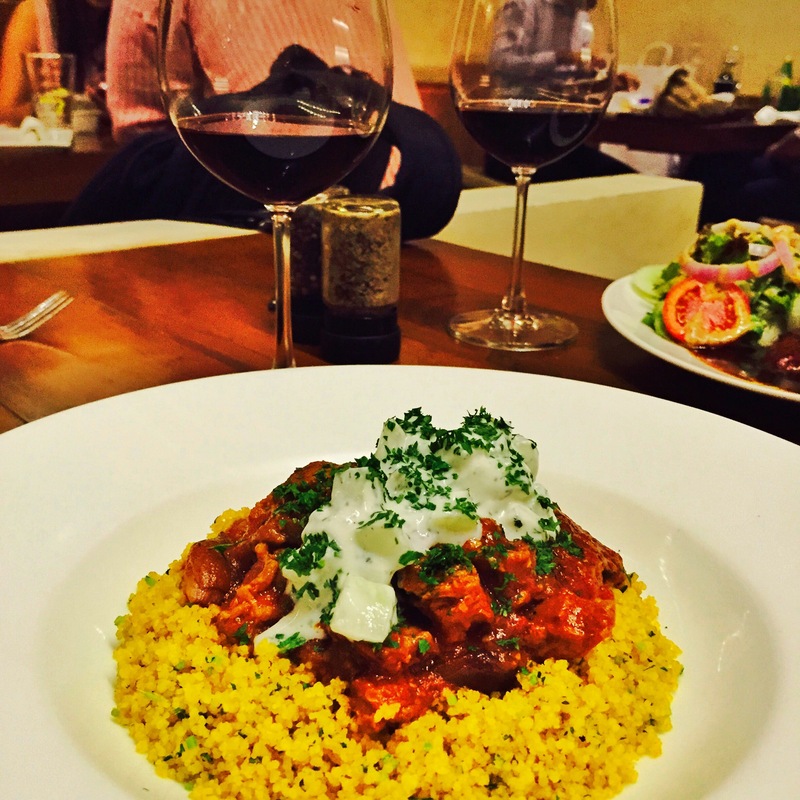 lamb shanks, couscous, and a glass of red wine. now that’s what i call a good night. bombay, india. 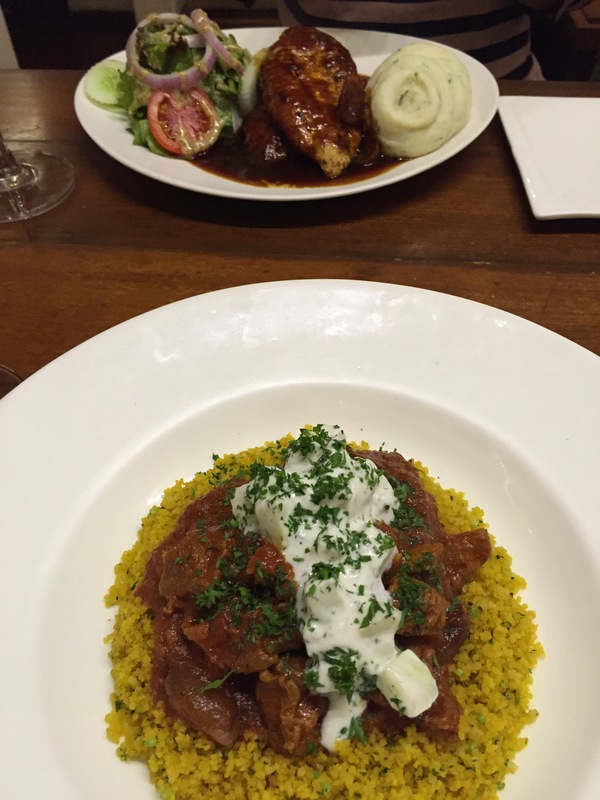 may 2015.
my lamb shanks in the foreground and bharati’s grilled peppercorn chicken – and mashed potatoes! – in the back. bombay, india. may 2015.
the bombay canteen. 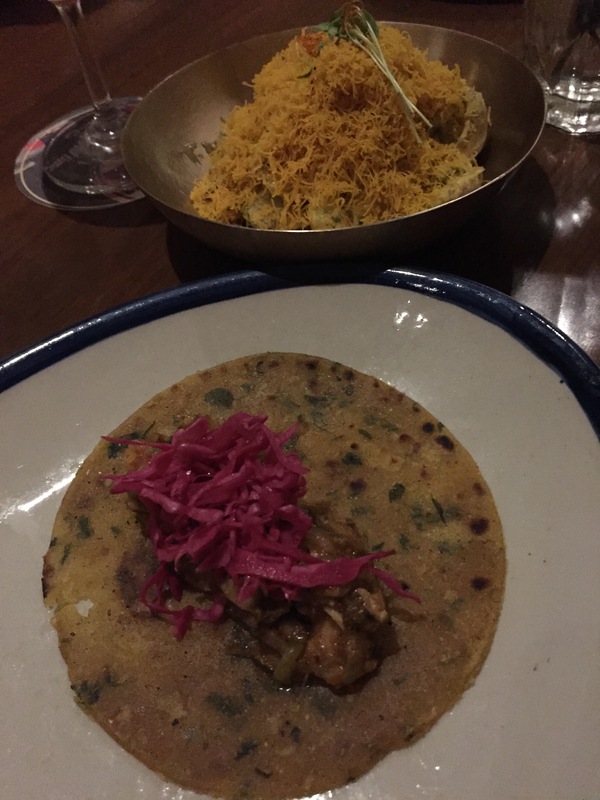 as a wrap-up to my two weeks in bombay, meg, bharati, and i had a little ladies’ night celebration at the bombay canteen in lower parel. we made friends with the waiters and bartenders [and i even scored a free whiskey sour! ], and we gorged on all sorts of yummy dishes. my particular favourites were the aloo bravas and the chicken tacos to start with as well as the “my uncle’s coconut mutton” that bharati and i shared as our main course. again a little pricey, but definitely worth a visit. tacos in the foreground, aloo brava in the back. bombay, india. 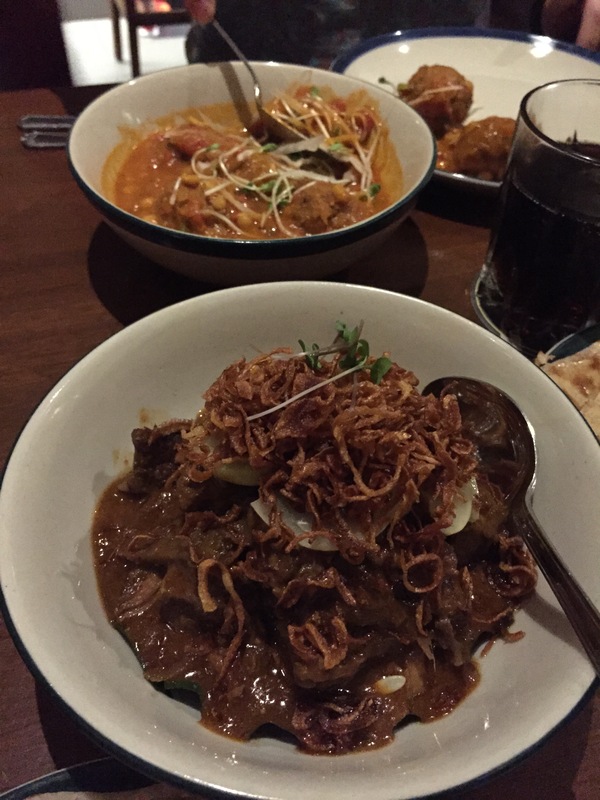 may 2015.
mutton curry in the foreground, kofta curry in the back. bombay, india. 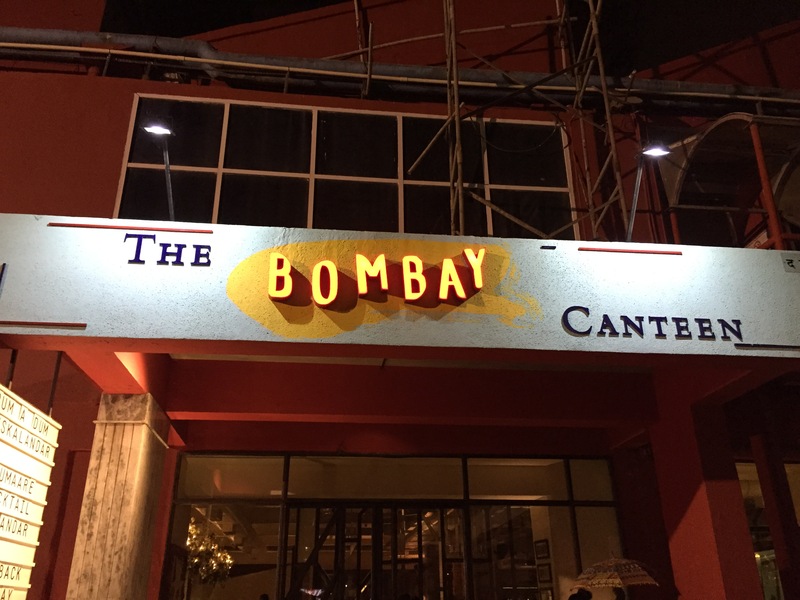 may 2015.
entrance to the bombay canteen. bombay, india. may 2015.
book number ten of 2015: zeitoun [dave eggers]. 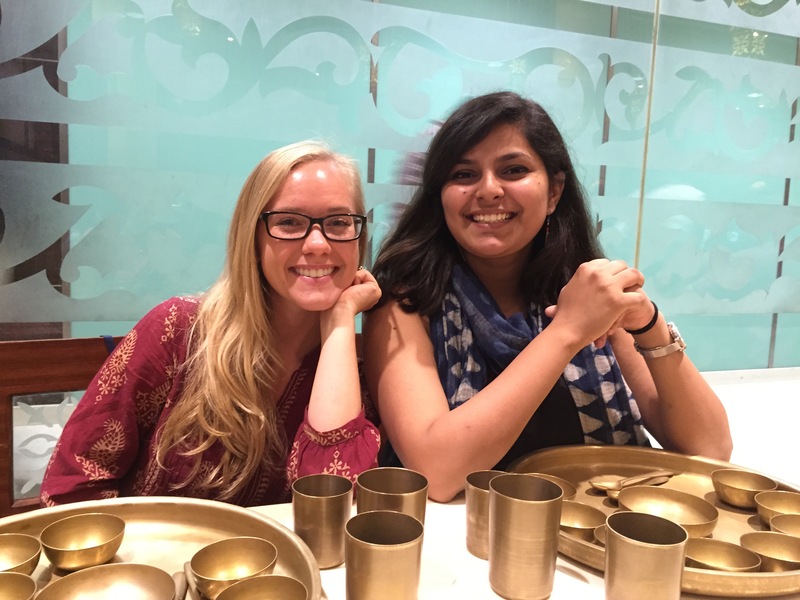 india travels: day trip to savandurga.